Now for the winner of Jessica's book Quilting On the Go! I wish everyone could win, but the RNG picked #45. The winner is Deborah! I also wanted to show you another example of how EPP isn't restricted to hexagons or diamonds. I've had this Camelot pattern by Trish Harper for ages; it sure makes a gorgeous quilt. The blocks are made for hand piecing, but I thought I'd try them using EPP. Here's the first one; it's a bit wrinkly since I pressed it with the papers still in, but I wanted to set the seams before I removed the papers. It worked pretty well, so I am busy prepping a few more blocks to take with me on my travels at the end of the month. I will be spending over 60 hours in the air in the space of a month, so I'll need plenty to keep me busy! P.S. 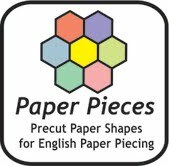 Don't forget that Paper Pieces is offering 20% off your shopping cart for the duration of the blog tour! Congrats to Deborah! 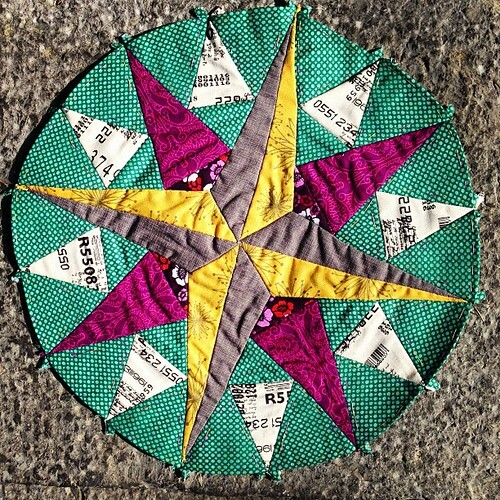 And, what a great idea on EPP'ing the circle block! I've had a couple designs like that on my want-to-do list, but I'm not a fan of the recommended piecing methods. I should just EPP them! Thanks for the inspiration! Yay :-) Thank you so so much - I can't wait to receive this book and start some EPP.